Diego Costa is back in the Atletico Madrid squad for the first time in over two months after recovering from a foot injury. 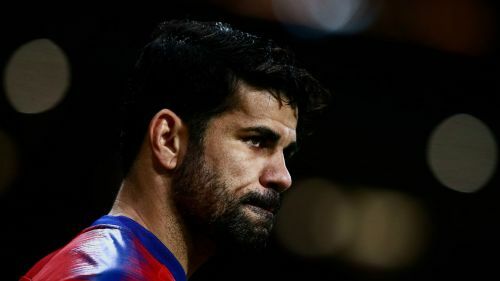 Costa last played for Atletico at the start of December and needed surgery to resolve the issue, but he is on the bench for Saturday's derby at Rayo Vallecano. The Brazil-born Spain international had been targeted for a return in time for next week's last-16 Champions League tie against Juventus, with the first leg played on Wednesday at the Wanda Metropolitano. Alvaro Morata partners Antoine Griezmann in attack with Vitolo and Angel Correa providing width for Diego Simeone's side, whose defeat at home to rivals Real Madrid last time out made it successive LaLiga losses. Take a look at Simeone's men for the #RayoAtleti match! Atletico captain Diego Godin starts on his 33th birthday but the Rojiblancos are still without injured World Cup winner Lucas Hernandez. Simeone's side would move within four points of LaLiga's summit with a win, although leaders Barcelona are at home to Real Valladolid later in the day.